As if "Cortana" itself were not cringeworthy enough (and any "personal assistant" program, in my opinion) . . . now it's limited to Bing and, ugh, Edge . . . Going to be seeing more and more and more of this. I've been a tech, running my own business for 20 years. I used to love what I did - I enjoyed working with Windows. .... Going to be seeing more and more and more of this.... I'm honestly sickened by what's happening, with Windows and the world of computer software in general - to say nothing of droves of hardware devices designed as disposable. Amen. Work machines are now playthings and highly limited ones at that. Why create things when you can simply amuse yourself instead until it breaks and you can buy another latest greatest. What about all the users with Windows 7 that are facing the decision to go to Windows 10, free download? Except for Linux, it seems to be the only way to go. Is there an option? Windows 7 support officially ends on 1/14/2020 so there are still about 4 years to go. When that time comes I would either continue to use Windows 7 (keeping things like browsers, Java, Flash, etc. updated), move to Windows 10 with Classic Shell added, or look for another alternative such as Linux. Scott. If you are interested in upgrading to Win10 for free, you can make an verified image of your present Win7 or Win8.1 installation, then do the upgrade to Win10. I like Macrium Reflect (free) but AOMEI Backup works well too. Make sure you have the backup disk made so you can boot up the disk and then restore the backup. Play with it, tweak it, optimize it, whatever. Then make an verified image of it. I would consider not installing much 3rd party apps at this point but make your image. If you want to play around for a couple of months on Win10 after that do so before deciding whether to revert or just drop Win7. But this way you have a fairly virgin copy of Win10 that you can migrate apps and data over to once reinstalled and updated a year from now or two. Then reinstall your Win7 if desired. The product key still works! Apparently once Win10 is approved, it is always approved so you can switch to Win10 later for free down the line by copying the image to the drive over your Win7 installation IF you did the upgrade before the July 29th deadline. One caveat: Win10 (and Win8.1) use Secure Boot. Win7 does not. The Win10 installation may activate Secure Boot if it is available on your drive. Once installed Win10 can be a problem to uninstall and put Win7 on the drive unless you go into BIOS and disable Secure Boot just before the reversion. If you are happy with 8.1 I see little reason not to upgrade to Win10. If you are happy with Win7, I can see why you are reluctant or refusing to upgrade to Win10. Wish there was an easy argument. I am traversing to Linux; Win10 being unacceptable to me from a control, privacy and security standpoint (THX god for GWX Control Panel), and Win7 having less than 4 years to go. So far Win10 looks like a big success, but there are still a lot of Win7 users standing pat. I would not however, wait until the last week or so along with the other fence sitters to evaluate Win10 if you wish. That last week will be a busy one for MS' servers I suspect and why be rushed in your evaluation? My thanks to both of you for your prompt and very informative replies. I have suitable spare hard drives, so I may try cloning Windows 7 Pro with Apricorn, before trying imaging. Microsoft warns Windows 7 dangerously insecure in 2017. I know nothing at all about Linux, not sure I'd be able to get drivers for all my hardware working on a new pc. Guess I'll stick with Windows 7. Even when they stop updating it, it should be fine correct?. I mean I still see a lot of businesses running XP. The article you posted above incorrectly characterizes Microsoft's intent to move people to Windows 10 before Windows 7 support ends as an indication that Windows 7 is somehow "dangerously insecure", which is rediculous. You will be fine sticking with Windows 7 until the end of support, and even for some time thereafter. Scott. Yes Scott I thought that that was kind of crazy. It's too bad things have to go this way. Scott I have the link you posted in the first post saved, but it doesn't seem to ever stop loading. Maybe it's my adblock extension or something. It works for me and I also have adblock running. Note that the link is from Archive.org as the original page is down, and archived pages usually take longer to load than the original. Scott. Scott, you still don't recommend Windows 10, right? 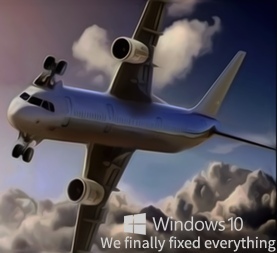 Windows 10 will be the only choice after Windows 7 is no longer supported. Until then I recommend Windows 7. Scott. Scott, will Windows 7 essentially be SOL after the end-of-support date even with a supported browser? I would say that using a fully supported browser would allow the OS to be used safely well after the date the OS is no longer officially supported. Scott. I mean I still see a lot of businesses running XP. What kind of businesses tend to use XP in this day and age, FatGuy? I've seen a few doctors offices, hospitals and some gyms use Windows XP. Um, is Windows 10 supposed to be the Windows operating system to end all Windows operating systems? Scott, why do you think Windows 10 doesn't have the software necessary for playing DVDs?